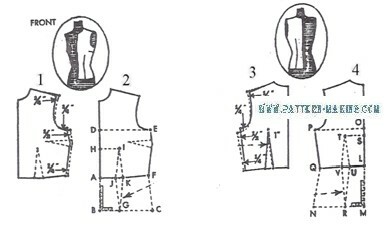 1 and 3) Using the fitted bodice front and back, add the extra ease allowance needed around the bust and waistline for the dress or blouse; then broaden the shoulders, and deepen the armhole. Shorten back waist dart 1”. A to B – Equals waist to . . .